A sound art installation made at The Swedish History Museum in Stockholm in 2015, in collaboration with Mälardalen University. of thoughts around the origin of the boulder and the time perspective that comes with it. As you enter the space a voice registers your entrance by counting the number of visitors passing through the door. 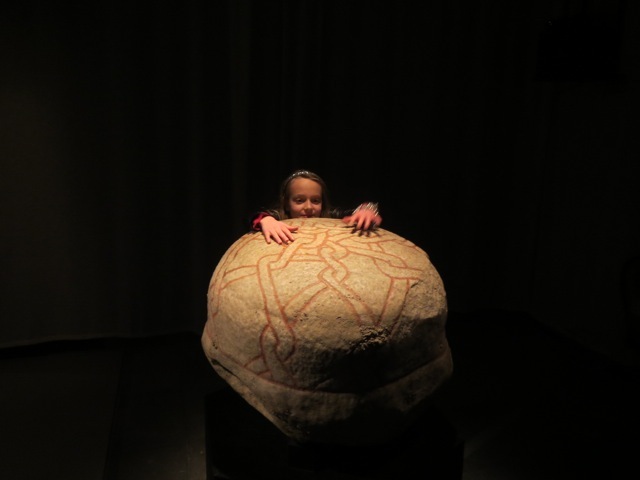 Walking around in the room you will hear single breaths or sighs that are echoed at the far end of the room where the viking age boulder is sitting. As you get close to the boulder the breathing gets more intense until you get really close and then it stops. If you reach out with your hand to touch the boulder a joyful laugh comes from above. From underneath the boulder there is a quiet humming, weaving together two songs. The time that passes while you take a breath is longer than the blink of an eye, but you may still think of it as just a short moment. Subtle changes that happen in a moment can affect you in a seemingly unproportional way. When the sun comes out from behind a cloud you sigh and feel relief. Perhaps what you are watching at that moment will from then on be associated with a sense of hope. During the vast timespace before you were born subtle changes like this occurred on infinite occasions. Like the moment the bumblebee lands on a plant and drops some pollen onto the carpel. Or when the sound of something very familiar suddenly stops and doesn't come back. Like when the heart stops.